Videos from all over the world poured in over the months of April and May in answer to our call for an addition to our team, and the competition was fierce. We would like to formally congratulate all these candidates for the Making the Team: 2010 selection process this year. You passion, creativity and enthusiasm for endurance sport was clear in your videos and in follow-up interviews. Thank you for reaching out to your communities to inspire those around you. Sarah and husband Steve volunteering as wet suit strippers at Ironman Wisconsin. It's always difficult to choose just one person from such an incredible pool of candidates but in the end, there can be just one. Please join us in welcoming Sarah Linder-Stenzel -- pharmacist, girl next door, and all around goodwill ambassador -- as the newest member of Team Evotri! Though not a requirement for our selection process, Sarah has finished Ironman and several other triathlons, in addition to being an accomplished runner. 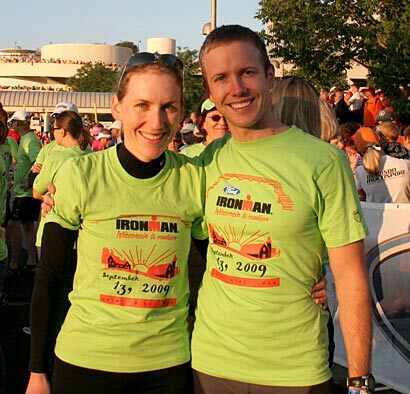 You can find Sarah and her husband Steve braving the harsh Minnesota winters by racing nearly every weekend alongside a group of recruited family and friends - wow! Sarah's mission in life is to see that those around her, especially those near and dear, follow a daily regimen of health, fitness and subsequent happiness. No matter where you are on the spectrum of inactivity or dispassion, after a short consultation with Sarah, be sure you'll have the medicine you need to turn it all around. Welcome aboard, Sarah! We're thrilled to have you as the newest member of our family.